Sapphire is the gem variety of corundum and is a 9 on the Moh's Scale of Hardness. It is the second hardest natural substance behind diamonds. 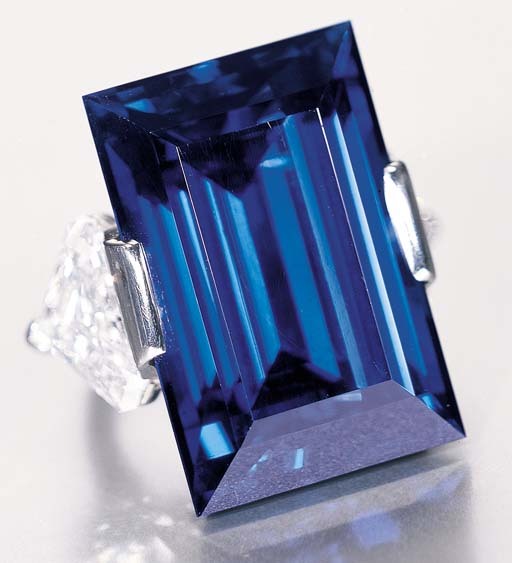 The standard to which all blue gemstones are compared to is, of course the Sapphire. Although blue is the most popular color of sapphire, they come in every color but red as red sapphires are actually rubies. 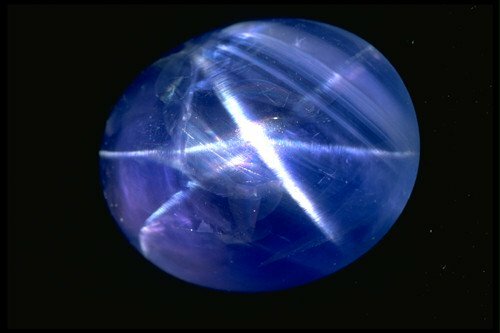 This 182 carat star cabochon cut sapphire is from Shi Lanka. 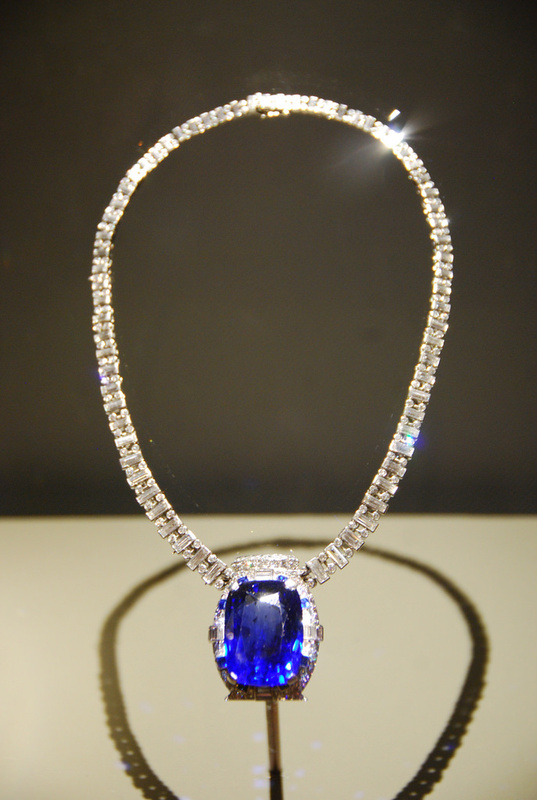 This beautiful violet-blue sapphire was given to silent film actress Mary Pickford by her husband, Douglas Fairbanks. She then gifted it to the Smithsonian Institution, where it is on display today. One of the world's largest faceted blue sapphire mined in Sri Lanka and called the Logan Sapphire, a 423 carat stone. Set in both silver and gold, this stunning sapphire brooch is framed by 20 round brilliant cut diamonds, totaling approximately 16 carats. Gifted to the Smithsonian from Rebecca Pollard in 1960. The Logan Sapphire has the distinction of being the heaviest mounted gem in the National Gem Collection. Widely considered the benchmark for all Burmese sapphires, the 62.02 carat Rockefeller Sapphire characterizes all the finest qualities of a Burmese sapphire. It is a legendary stone and one of nature's greatest masterpieces. The rectangular cut sapphire is flanked by cut cornered triangular diamonds, mounted in platinum. It is also signed by Tiffany & Co. Mounted in platinum and designed by Cartier in 1935, the Bismarck Sapphire is 98.57 carats. Set with 312 baguette and round brilliant cut diamonds and then accented with 8 square cut sapphires. 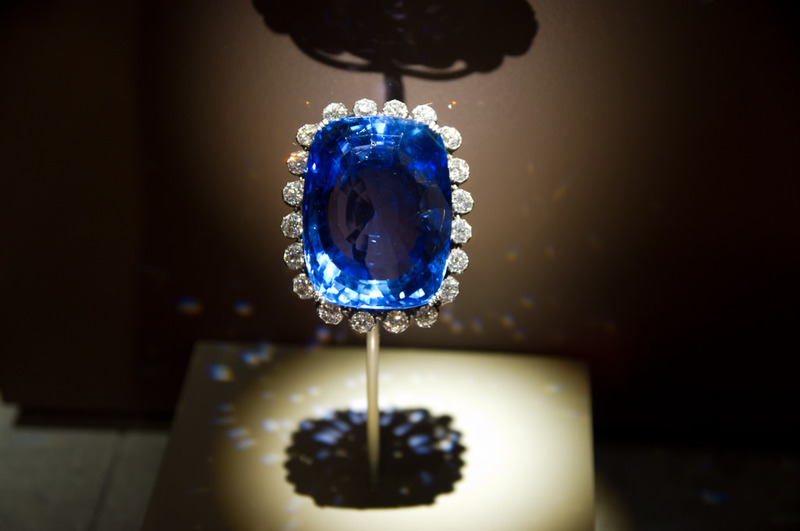 Donated in 1967, by Countess Mona von Bismarck to the Smithsonian, the sapphire is on display in the Gem Gallery at the National Museum of Natural History. The sapphire brooch gets its name from the Russian Empress Maria Alexandrovna. Purchased at the Great London Exhibition in 1862 by Czar Alexander II, it is also the 14th largest sapphire in the world. The sapphire was subsequently set as the centerpiece of a brooch that also consisted of 56.60 carats of diamonds.